This book’s title is pretty intuitive as the story really is about what happens in the afterlife of an old man named Eddie, who found his end at his workplace. As the title “spoils” it for you, he arrives in Heaven, where he meets five people, people whose lives somehow are connected to his. The role of those five people is to help Eddie make sense of his life, as his life had its fair share of drama and for the most part Eddie was not at all pleased with the life that he led. The entire story is based on the fact that you cannot be at peace until you have made peace with yourself. And so, the role of the five people is to ultimately bring peace to Eddie even though throughout the story Eddie relives some of his life’s saddest moment and goes not understanding what exactly is happening to him and why to denial, despair to sadness to … you’ll see what when you read the book. I don’t want to spoil the ending. Also, the ending might be the book’s forte and a surprise worth reading for. 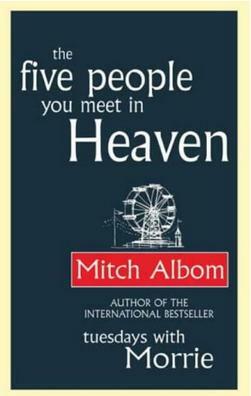 One of the downfalls of social media is that I kind of lost respect for motivational sayings, inspirational quotes and such, because they were shoved down my throat for such a long time, that the simple and clear language makes me appreciate less the way Mitch Albom delivers some of his pieces of wisdom. I have to stumble upon something really deep or abstract or that resonates to my perception of things so I can appreciate a certain quote. But I still have a guilty pleasure regarding this kind of pieces of advice so, on occasions, I do post those simple-straight forward- cheesy quotes myself. I am not saying the lessons from this book are not valuable, but the simple way they are delivered does not satisfy my need for deeper knowledge. Or maybe I am just not the target audience for this book. Maybe I would’ve appreciated it more in my teens. I need to find some other authors that wrote on the subject because I am really interested right now as I don’t have a certain opinion or philosophy that I strongly believe in regarding this matter. “The five people you meet in Heaven” is a story that offers comfort and a new or a different perspective for those who believe in life after death. I think it can appeal to people, religious or not. You can find certain meanings or discover lessons that you can apply to your life’s philosophy whether you believe in God or not. It is a story that flows easily and is also a relaxing read that can come in handy on your cozy nights when a soft blanket, a cup of tea and a good book is all you need. Have you read this book? Are you tempted now?